After he was charged for attacking a handcuffed and blindfolded man on video, a jury, apparently blinded by the badge acquitted this brutal officer. Denver, CO — As TFTP has reported at length, police in America can attack without provocation unarmed and even handcuffed and restrained individuals and face little to no consequences. A recent case out of Denver, Colorado backs this notion up even further after a jury acquitted a cop who was seen on video attacking a handcuffed and blindfolded man. Former Denver Sheriff’s Department Sgt. Randolph Romero, 50, has a bit of a temper according to his past. He is so unable to control himself around restrained individuals that his last infraction actually got him charged with a crime. Last year, Romero was seen on video attacking his victim as two other officers helped him transport an inmate. As the video shows, the man is not resisting at all and his face is up against the wall as Romero holds his neck. Without provocation, Romero then attacks the handcuffed and blindfolded man, slamming him to the ground and holding him there for no reason. The force of Romero’s weight landing on the handcuffed and blindfolded man’s body fractured his wrist. Subsequently, after the video made its way to supervisors and eventually the district attorney’s office, Romero was charged. Like many officers accused of a crime, Romero was allowed to resign before he was held accountable in an obvious attempt to keep his pension in the unlikely scenario that he was actually found guilty. Sadly yet predictably, he was not found guilty and this was music to the ears of the police union who claimed that Romero slamming down a handcuffed and blindfolded man without evident cause was good police work. The union then went on to attack the DA who brought charges against Romero for daring to hold a cop accountable. 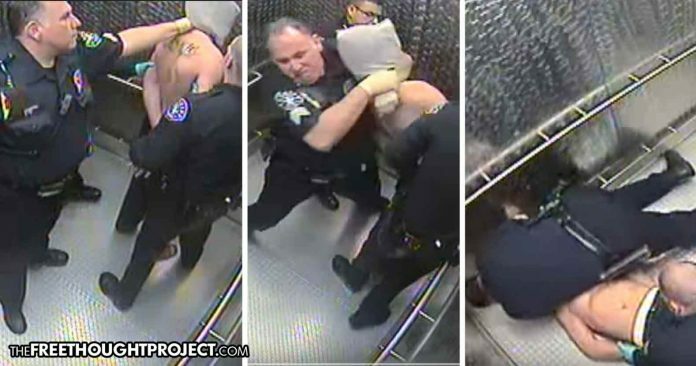 This “good law enforcement officer” is no stranger to beating restrained individuals either. Months before he was seen on camera attacking a handcuffed and blindfolded man, he was seen on video punching a man restrained by fellow officers. In that video, Romero is seen in an almost comical fashion falling over other officers as he scrambles to inflict pain on an inmate who Romero appeared to challenge to a fight. For this incident, Romero was suspended for 40 days with no pay. Now, this officer with a history of losing his temper will likely ask for his job back and continue in his ways knowing full and well that he can and will get away with it.